265 divers arrived from all corners of the country to dive into the murky, dark depths of Lake Windermere, Cumbria, to highlight issues of water pollution by retrieving rubbish that people had abandoned in the water. The charity Friends of the Lake District commissioned a response to the event through the creation of three sculptures: Dereliction – a personal conceptual response and two suspended creations in the form of diseased fish, developed with the assistance of two local primary schools. The sculpture commission formed part of the finale for the major three-year project Secret Windermere. An antique bottle lies as a dead fish, floating in its own watery grave inside the damaged buoy, trapped on a lake of broken glass. 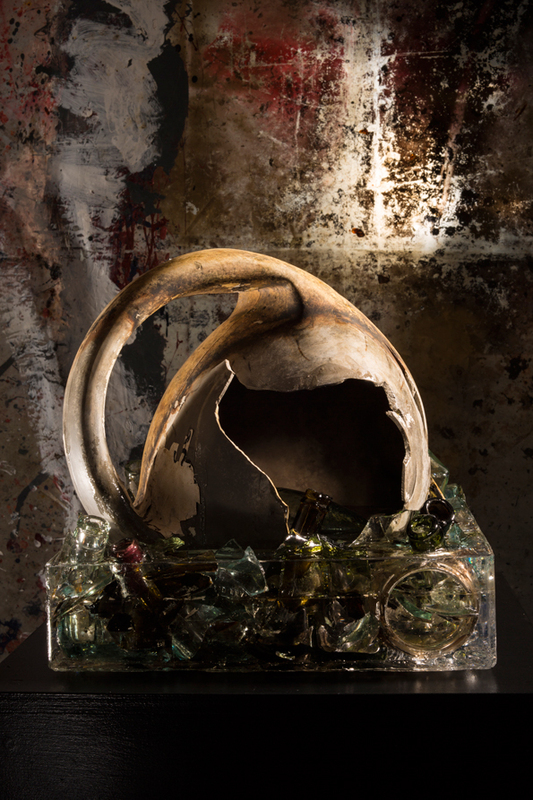 Resurrected from the Lake’s polluted depths the shards signify danger juxtaposed against the sanctuary of the float. Symbolising the degrading planet, in its form and condition, the buoy lies silent and still. FLD Amanda McCLeery led an informative session on the pollution issues affecting Lake Windermere. Jac Scott then invited the children to imagine that they were under the water looking for fish. Initially the school pupils made collages of healthy, but endangered, Arctic char (Salvelinus alpinus) to try and understand the value of biodiversity and ecological balance. The following day the children built on these making skills and created three-dimensional unhealthy fish from waste materials. These workshops inspired the Flying Fish sculptures created from debris retrieved from Lake Windermere. Dimensions: 100 x 50 x 17 cm plus suspension line. Many thanks to Photography by Ward for the photographs of the sculptures.